My First Land Locked Salmon? 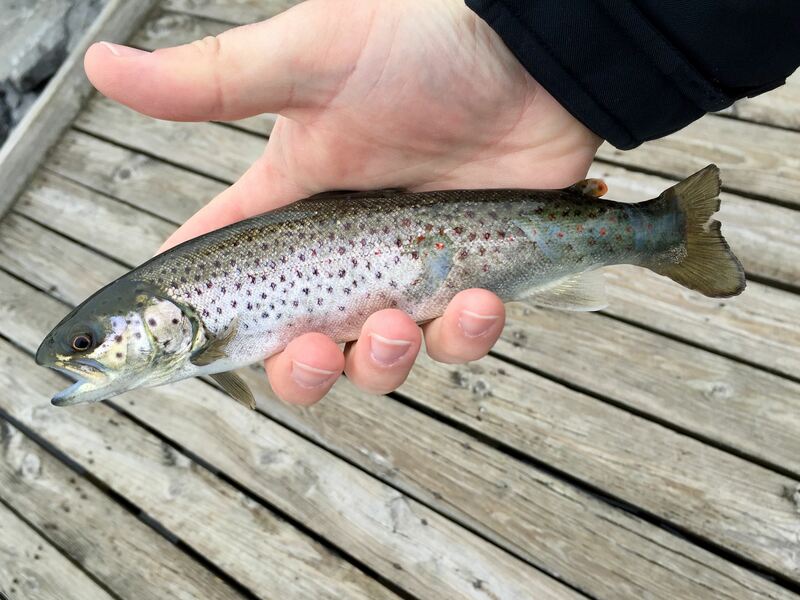 Caught this guy at Seneca Lake today (finger lakes of NY). I was just messing around off a dock with a bunch of fish under it and this one grabbed my jig. So I'm wondering if this is my first LLS? Re: My First Land Locked Salmon? I honestly have a hard time differenting them from brown trout, especially when they are smaller. Something about the tail is supposed to be different I think. The eye is too far forward for a landlock,tail is to square and the telltale red spots therefore I believe it is a Brown Trout. I looked at a 100 pics this morning and eye head are the only things i could say didn't look quite right. Hatchery fish have been known to be mutants though from time to time so i didn't comment. I assume they hatchery fish at least. Yea looks like just a regular old stocked brown. Damn. I know the finger lakes have LLS so I was hopeful. Now thats a great plan!!! That would be cool to fish the morning of your wedding. You should do it... it will be something you alway remember! Ha! There better not be an evening hatch going on or there will be HELL to pay on your wedding night. The real question is, will it also be something my WIFE always remembers! great catch, a brown I am sure, I have a photo of a brown and a landlock that I caught in NJ last year (too large to attatch). and it looks more like the brown.